I have a confession to make: I like London. I’ve been told, in the past, that I’m not supposed to like London; I’m a ‘Northerner’ and, therefore, supposed to be genetically programmed to dislike the City. Somewhere deep down in our ‘Northern’ DNA we automatically expect Hogarthian scenes of depravity, vice, and eighteenth-century decay. Or perhaps we’re expected to be humbled ‘oo, it’s SO BIG’. Or we expect to be deafened by yahboorah buybuysell types in 80s pinstripes and/or ginormous Dynasty shoulder pads. Or be out-cooled by Shoreditch hipsters in chocolatey coloured corduroy turn-ups and no socks. Or succumb to being swamped, taking a tumble while the busybusy-outta-my-way-scum-I’m-too-important-for-you-crowds of the Tube rush hour crush you, and your dusty, barely used Oyster card, into the grubby tiling. Anyway. I went to London on Monday night for a Tuesday symposium – a lovely Greek word used for being a bit fancy in depicting ‘a meeting or conference’. I’ve written more sensibly about the symposium on the Writing Rochdale blog. The rest of this blog is given to whimsical memories that are possibly not completely faithful nor verifiable. . .
London is one of those places where I feel like I’ve lived many other lives in this one life. I love walking through the City. In 2001, before I had read any Iain Sinclair, I had read Virginia Woolf’s Mrs Dalloway several times – a character whose life was miles away from my own – and enjoyed Clarissa’s London perambulations, her internal ponderings of home, flowers, and the roadsides, ‘beauty everywhere’ (apologies if I’ve misquoted). A boyfriend-of-the-time lived in the City and yes, there are the nostalgic memories: skipping down myriad streets until lost and using maps in bus stop to relocate ourselves; kneeling in the wet grass to watch bumblebees in lavender in one of the many parks – I can’t recall which one; getting covered in the anti-climb paint on the Cutty Sark. That first-time-feeling of falling in love, and then strangely beginning to love the built environments: the concrete weirdness of Elephant and Castle, the ginnels near Aldwych, brutalism meeting medieval buildings – like two people who probably shouldn’t be friends but somehow are. Walking over Vauxhall bridge, following the changes of the worlds above the pavement. Curving around the Oval, a diversion through Kennington Park. Then the fast food fug – a chorus of grease, cheese, meat, the sharp note of warmed tomatoes – on the way to Camberwell. Fourteen years, or so, ago, well after Camberwell, the clichéd and inevitable, ‘it’s not you, it’s me’. No, let’s have an alternative London memory, another version of a life. Thirteen, or so, years ago – the handful of years of squats, campaign camps, joss sticks – three of us went to an all-night club. Walking from the south, accompanied with an outgoing sparkly haze that gave an aura to everything. Early sunlight bouncing off the painful red of a phone box outside the bright Portland stone of St. Paul’s Cathedral. ‘Dome’ became a word with bass resonance, pursed lips, inexplicable humour: duh-oh-meh. The perfection of a spider’s web at 6am, pear-shaped dewdrops filled with a refracted aspect of the cathedral in miniature. Then, a small breeze whipped up a cone of white polystyrene pellets, pure magic. What a strange thing it is to be alive, to move from place to place and to somehow take a piece of each place with you – even if only half-remembered. Mismatched memories. A patchwork of the physical and emotional. Wear it like a gown. Or, go back further, thirty-three, or so, years ago, and I’m smaller with a blunt-cut fringe. My family and I have walked over Tower Bridge, heading towards the Beefeaters (why they weren’t eating steak? ), the ravens, and the Tower. A stranger had chased after us; I had dropped one of my yellow security blankets on the bridge. I took it back with a shy ‘thank you’. There’s a photograph from that day, taken outside the gates of Buckingham Palace my face is part-hidden in the blankets. They’re changing guard at Buckingham Palace. Christopher Robin went down with Alice. We were ‘Northern Tourists’, swinging hands, adhering to the visitor rites: the sights of the sites. Before the Shard. Before the London Eye. Welcome to the London Eye. Before the second Ring of Steel. Seventeen, or so, years later, after Camberwell, back in London in 2018: watching the sunset from Waterloo Bridge and the sun dip behind the buildings. 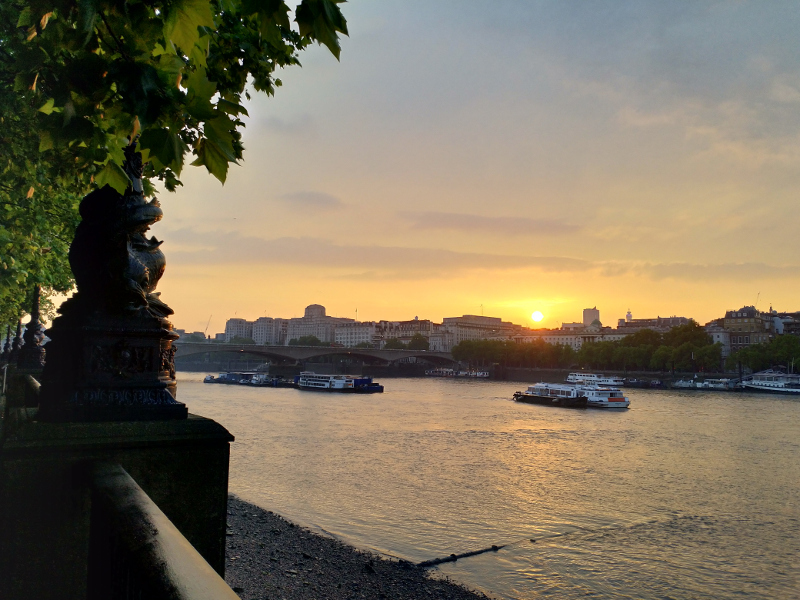 A walk along South Bank towards Blackfriars, witnessing a Waterloo Sunset was incidental; a gorgeous coincidence. Talking about possible futures (what to do post-PhD, where to go post-Brexit), wondering whether my long-suffering Doc Martens would survive a random attempt at mudlarking (possibly not), then offering to take a picture of a lad and his girlfriend (he would rather it be a Selfie). I wonder where will they be in years, or so, later? Crossing over the metal backbone that forms the Millenium Bridge – a cyberpunk throwback to The Matrix. Walking up towards St. Paul’s and finding it inevitably closed. Outside the building, a newly married couple took cheeky photos with a handful of well-dressed friends as if to pretend that’s where they were wed. The bride’s veil was the length of a black cab, a sea froth of chiffon. Past the couple, heading towards St Martin’s In the Fields, a bin cart rattles past, over the speed limit, bumping out a violent guff of bin juice, the scene now somewhat malodorous. But it’s OK, it’s expected; it’s the sort of thing that brings one back to the present, away from the trap of nostalgia. This ancient city with its ghosts, its memories, its palimpsestic mappings, its quotidian stories, its ups and downs, its human cruelties and opportunities, its dirt and glamour, and its literary depictions. Yes, I like London, and it’s woven into my many lives. This entry was posted in Jennie B, Writing and tagged London, memories, place writing by jenbee. Bookmark the permalink.